Rainwater harvesting systems are an excellent way to reduce water consumption, minimising pressure on the water supply and cutting your water bill costs. The soft rainwater doesn’t create limescale and is perfect for watering the garden and cleaning. With water being a valued commodity Rainwater Harvesting system installation have been over the recent years. 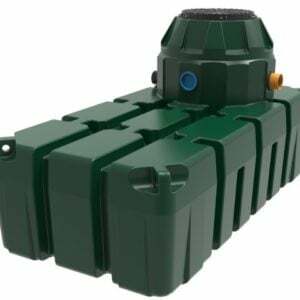 There are various advantages to saving rain water in a rain water harvesting method, the most important one being the saving made on metered water costs that can see up to 50 percent savings. Additional benefits to harvesting rainwater include contributing to reduced flood dangers and reducing the load combined sewer overflows improving river water quality. It's estimated that 54% of water used in the home could be replaced by using rainwater that was harvested. This includes water used for toilets, washing clothes and watering the garden. Our Harlequin HydroStore range comes in 6 different capacity sizes, large, shallow and multi tank options. It is crucial to chose the size of tank for your needs. Visit our 'What size of tank? page to work out what size of tank you need. Garden Harvest: A very simple system that allows the connection of a hose within the tank to provide water for irrigating lawns, gardens and car washing. 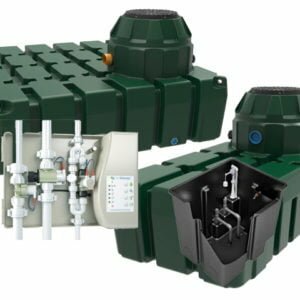 Home Harvest Direct: When supply of rainwater is exhausted, the 'Backup in a Box' unit uses mains water to replenish the tank. The pump in the tank is then ensured of a constant supply of water to feed washing machines toilets garden taps, etc..
Home Harvest Gravity: Using the Rain Director system, rainwater is pumped to a header tank where gravity distributes it to the water appliances. This minimises wear on the pump and pump on/off cycling, reducing cost that is electrical. The system ensures that the rainwater tank is replenished with mains water once the stored rainwater is exhausted.